OnPage Email Form is a easy to setup responsive module that loads when a user visits the website . The forms asks the email id of the visitor. The website can't be browsed till the visitor enters a valid email address. 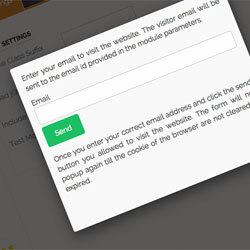 The email address along with the IP Address of the visitor will be mailed to the email which has been set in the module parameters.The popup opens once per user and the number of days for the popup to pop again can be set in the parameters.